The App lets you display your latest tweets at your site’s front end. It provides you to display your latest tweets by allowing you to put your twitter username and will display the latest tweets of those users whose username you have entered. Latest tweets will be visible on the front end by the customer. 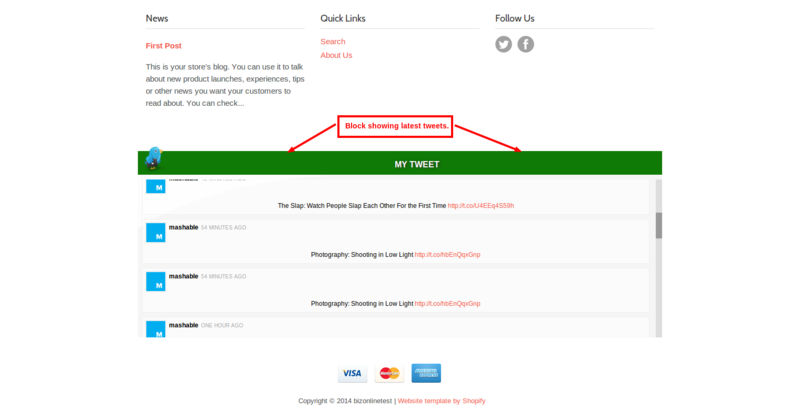 The block showing latest tweets can be displayed anywhere in your page as per your requirement. The block showing latest tweets can be displayed at every page of yours or on a specific page as per your requirement. Height and width can be managed. You can also change the configuration settings as per your requirement. Fetches user profile or page feeds onto the store. Admin Sets Number of Tweets, i.e. he can increase or decrease the number of tweets to be displayed at once. Admin allows the users by entering the Twitter user name. Admin can also select twitter icon from the various twitter icons available. Consumer Key & Access Token is also managed by the Admin. Admin can set the location anywhere on the entire page. After clicking on the Themes tab launchpad page will appear. 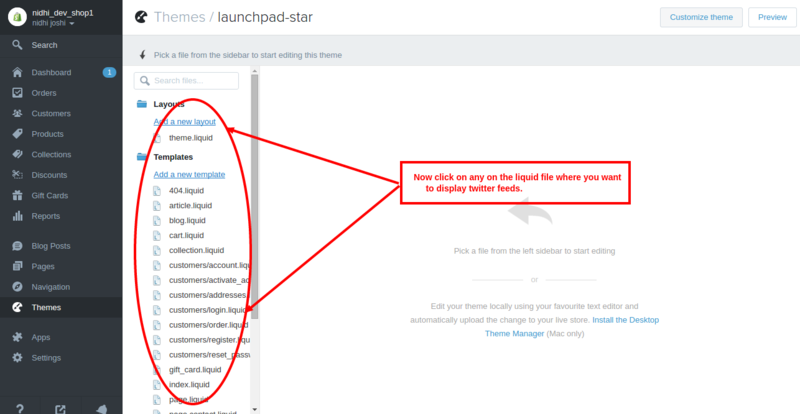 From the launchpad click on themes.liquid menu. After clicking on themes.liquid menu, paste the following code at any place where you want to display the latest tweets. Click on Save button after pasting the above code. Now after saving the code go the front-end, the Latest Tweets will get displayed at every page according to the place where you have pasted the code and default configuration values saved during installation. You can also change the configuration settings for the latest tweets. Once you install the application you will redirect to the Twitter Configuration page. The Latest Tweet Configuration page will consist of a form displaying the default configuration values saved during installation, you can change them according to your requirement. You can also visit the configuration page from the Shopify page. Go to Shopify and click on Apps menu. 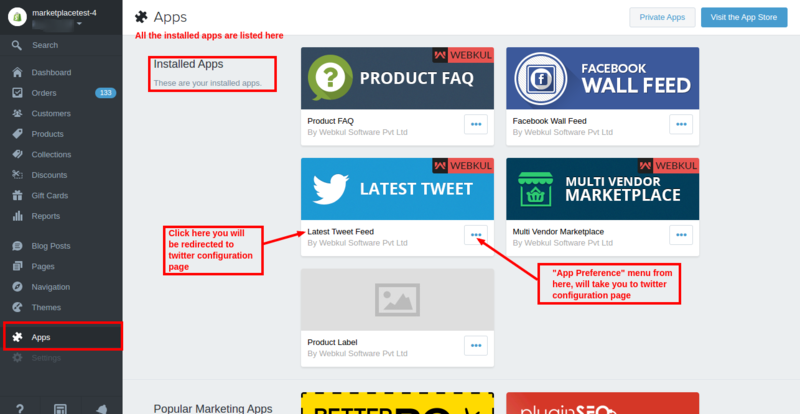 All your installed apps will get displayed then click on Latest Tweet link or click on App preferences option of the app, you will get redirected to the twitter configuration page. 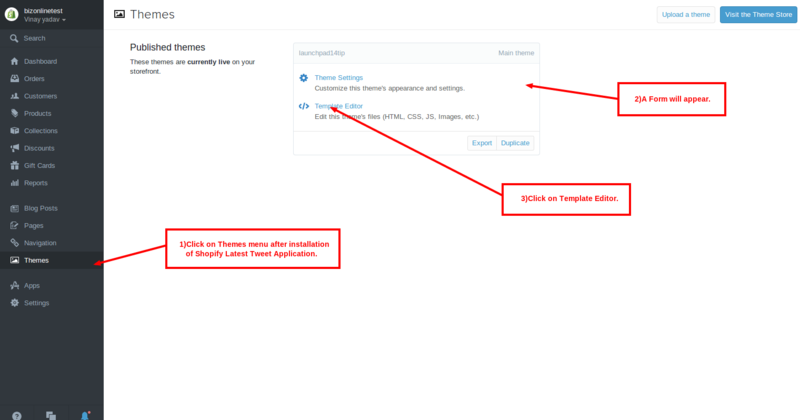 Edit the values from configuration page according to your requirement and click on Save and Continue button, you will get redirected to the welcome page which consists of all the instructions which are to be followed for using the application. 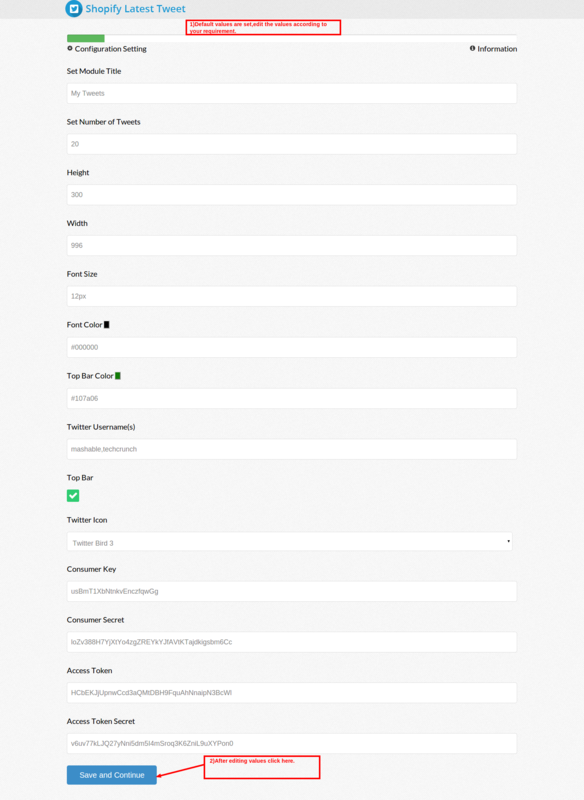 Follow the steps given in welcome page and your latest tweets will get displayed on your site’s front-end. Click here on Latest Tweet App to get the app.